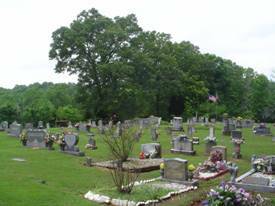 The Gravelly Springs Cemetery is located west of Florence, Alabama in the Gravelly Springs community. The name is spelled with one “L” on the church sign and with two “L’s” otherwise. 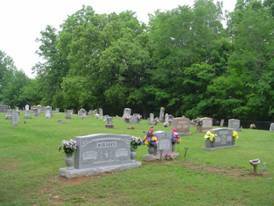 To reach the cemetery, travel west from Florence, AL on AL Highway 20 for approximately 3.3 miles. Turn left (west) onto Co. Rd. 14 and travel approximately 12.3 miles. At the intersection of Co. Rd. 14, Co. Rd. 5 & Co. Rd. 2, turn right briefly then left onto the gravel drive going to the Gravely Springs Missionary Baptist Church. The cemetery is located behind the church. This is a very old cemetery. The old church stood here during the Civil War. The present church was constructed using some of the material from the old building. There are over 25 unknown graves here marked only with field stones. The text shown in the list as a different color from the rest indicates the names of an entire family that perished in a home fire on April 2, 1933. Angel, Courtney; b. 22 Feb 1879, d. 09 Aug 1903, wife of W.W.
Cannon, Eugene; b. Sep 1874, d. Nov 1874, son of J.P. & K.W. Cannon, Ray; b. 10 Sep 1872, d. 17 Nov 1873, son of J.P. & K.W. Carroll, Franklin Wilson; b. 07 Oct 1842, d. 08 Jan 1922, Pvt. Co. “D” 9th AL Inf. Carroll, Lena L.; b. 13 Aug 1870, d. 13 May 1894, daughter of F.W. & Lizzie C.
Carroll, Lizzie C.; b. 20 Mar 1854, d. 24 Aug 1896, wife of F.W. Chandler, Lida B.; b. 28 Oct 1858, d. 06 Jul 1862, son of E. & R.
Chandler, Rachel; b. 07 Jul 1830, d. 29 Mar 1899, wife of E.G. Daniel, Margaret S. (Clemmons); b. 08 Jul 1947, only date, wife of Horace O.
Fulmer, Mary A.; died 02 Apr 1900, 80 years of age, wife of Peter A.
Hart, Amanda F.; b. 20 Jan 1836, d. 01 Aug 1907, wife of H.M.
Hewitt, Babe; no information, wife of T.F. Irions, Annie W.; b. 09 Aug 1878, 09 Nov 1880, daughter of J.J. & M.A. Irions, Mattie; b. 08 Apr 1867, d. 10 Jan 1947, wife of W.N. Olive, B.A. ; b. 10 Oct 1854, d. 22 Feb 1903, wife of J.D. Olive, Little Bertha; b. 19 Sep 1901, d. 22 Nov 1901, daughter of Thomas A. & Fannie F.
Olive, Maggie; b. 16 Dec 1903, d. 05 Jun 1905, daughter of Thomas A. & Fannie F.
Parham, Emma; b. 09 Nov 1854, d. 25 Apr 1936, wife of C.M. Parham, infant; 30 Jan 1876, son of C.M. & E.
Parham, infant; no dates, infant of C.M. & E.
Parham, N.E. ; b. 16 May 1880, d. 26 Sep 1880, daughter of C.M. & E.
Perkins, Laura J.; b. 15 May 1865, d. 15 Oct 1895, wife of Noah J.
Pitman, George H.; b. 04 Apr 1904, d. 06 Jun 1922, son of P.E. & E.S. Pitman, W.A. ; b. 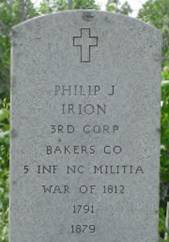 25 May 1867, d. 31 Aug 1890, son of W.R. & S.J. Potts, Sallie A.; b. Dec 1839, d. 12 Mar 1887, wife of J.A. Potts, Walter B.; b. 22 Feb 1876, d. 13 Oct 1886, son of J.A. & S.A.
Rhodes, Annie Kay; b. 09 Feb 1905, d. 22 Sep 1911, daughter of W.G.J. Rhodes, Annie Stuart; b. 28 Dec 1869, d. 06 May 1870, daughter of G.S. & R.E. Rhodes, John; b. 1846, d. 1871, son of Noah & C.A. Rhodes, Mary (Copeland); b. 05 Aug 1862, d. 01 Feb 1930, wife of C.S. Rhodes, Mary C.; b. 06 Nov 1887, d. 29 Oct 1903, daughter of C.S. & M.L. Rhodes, stone broken; no given name, 15 Oct 1839, d. 04 Oct 1882, wife of G.S. Rogers, Abbie; b. 16 Mar 1872, d. 05 Oct 1915, wife of R.G. Schmuck, infant; 19 Apr 1920, son of A.C. & H.
Swartz; baby; 03 Jun 1916, daughter of G.W. Thomas, Thurza; b. 17 Mar 1909, d. 22 Jul 1909, daughter of J.R. & M.E. Tomlinson, Angela J.; b. 18 Nov 1953, d. 16 Sep 1975, daughter of James T.
Wesson, Lottie L.; b. 25 Aug 1869, d. 29 Sep 1894, wife of R.H.
Wesson, Susie; b. 02 Oct 1878, d. 10 Aug 1916, wife of Robert H.
Whittle, Edward; 05 Oct 1856, son of W.N. Whittle, William; 17 Feb 1861, son of N. & O.
Winborn, Susan J.; b. 14 Oct 1868, d. ?? Apr ??? ?